bc Story papers, the British weekly reading format for boys and girls back in the arly 20th century. Page updated 22nd February, 2014. What you may have been reading 100 years ago. According to Bill Lofts' and Derek Adley's OLD BOYS BOOKS: A COMPLETE CATALOGUE (1969, privately printed, later re-published by Howard Baker, London) the first juvenile paper to appear was most likely 'The Young Gentleman's Magazine', published by G Kearsly, Fleet Street, London in 1777. Copies of this paper are said to exist in Yale University. (Confirmation on this point would be appreciated.) 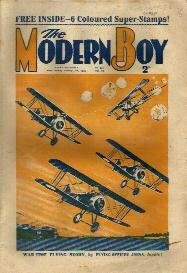 The first popular juvenile publication to appear on a weekly basis in England was 'The Boys' and Girls' Penny Magazine'. This appeared in September, 1832 and consisted of 8 pages, the numbers of which began the tradition of running continuously, enabling an index to be bound in with multiple issues. At least 23 issues appeared. The cover was mostly taken up by an illustration and the main story was usually a fairy tale. According to our two intrepid investigators mentioned above, issue 21 contained the following remarkable statement: "The Christmas sale of this periodical was...a grand total in figures of 835,000 copies being sold in one week." Other similar publications soon followed, encourage no doubt by the above statement, whether it was fact or fiction. The first so-called 'penny dreadful' appeared in 1866 - Charles Stephens' 'Boys of England'. It was indeed priced at one penny (1d) and the fiction was of a simplistic nature, each paragraph consisting of no more than two sentences. Hundreds of writers were required at the turn of the century to keep all these papers going. 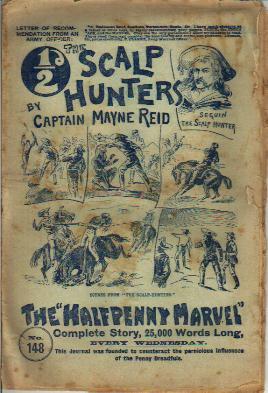 Penny dreadful papers died out by the turn of the century and were replaced by the modern types of story papers, the first being the 'Halfpenny Marvel', published by Alfred Harmsworth, in 1893. 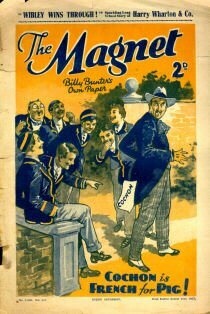 This ran for 533 issues, became the 'Marvel' in 1904, ran for a further 952 issues before being absorbed into 'Sport and Adventure' in 1922. 'Union Jack' and 'Pluck' appeared in 1894. Other publishers involved in the publication of Story Papers included Aldine, Pearson's, James Henderson and Trapps Holmes, before the Amalgamated Press cornered the market in the 1920s. The Scottish firm D C Thomson managed to keep five papers going as well, there being such a wide demand in the years following WWI for cheap juvenile literature. With the arrival of WW2, paper shortages helped kill off most of the weekly story papers, as did the loss of staff to the armed services. TV and American comics arrived in Britain after the war and helped finish off the newer papers such as EAGLE, BOY'S WORLD, RANGER and GIRL'S CRYSTAL. Many generations of readers learnt how to cope with life through what they read in these papers and they hold a continuing fascination for collectors of juvenile literature. There is often a fine line drawn between the description of British Story Papers and COMIC PAPERS. FILM FUN contained both stories and comics, but the comic strips usually predominated, so it is generally listed as a comic paper. All these publications of the 1930s, both Story and Comic Papers, were offered at one time or another with FREE GIFTS. In America, I think these may have been called 'Premiums'. To the right you'll see a scan of THE JESTER #147 dated September 3, 1904. 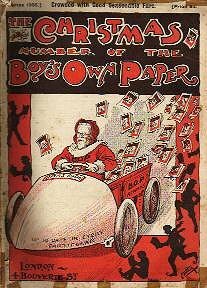 This was a tabloid size comic paper of 16 pages which ran through a variety of name changes. This issue for example is actually The Jester and Wonder, The Great Home Serio-Comic ! The Bunsey Boys cover strip resembles the Katzenjammer Kids. To the left is #148 of the 'Halfpenny Marvel'. (September, 1st, 1896) To quote from the cover blurb: 'This journal was founded to counteract the pernicious influences of the Penny Dreadfuls'. A complete story, 25,000 words long. This issue, 16 pages plus covers which were blank inside; strange indeed that advertising wasn't placed thereon. The main story ran to page 15 where a short story 'Paying the Penalty' filled the page. Page 16 was the editorial: The Editor Speaks', signed by 'Pimple', 'Chief Orfis-boy to the Marvel'! The rear page was a full page ad to 'Comic Cuts', the colour comic paper. The cover includes a letter of recommendation. "31 Esslemont Road, Southsea, Portsmouth, Hants. - Sir - I have much pleasure, as a father of three boys, in highly recommending your papers, PLUCK, the UNION JACK, and the MARVEL. They are the only periodicals I allow my children to read. I have read them, and consider the tone healthy and moral, and patriotic. I remain, Sir, yours obediently, F. CLARKE, Army Warrant Officer." Having read some excellent Philip McCutchan seafaring novels (see the reviewx.html page) I retrieved several more cartons from storage containing more of Tom Ebbage's story paper collection. Among the piles of The Popular and two bound volumes of same, 1920 and 1921, were a number of single issues of PLUCK. Have you ever looked at a cover and known that your were about to embark upon an outstanding read? The issue of Pluck in question was Vol.10 new series no.320 dated 17th December 1910. The title, 'Special Duty', st 'A Tale of Spearing P.P.'. No doubt Steve will be able to tell us who authored the story. My first thought was it was written by Charles Hamilton, because Tom generally only collected papers with Hamilton stories. The tale involves a colliery strike and is both exciting and believable, with remarkable attention to details. Police Constable Spearing is a relatively unconventional hero, and is underwritten; things happen around him. His character is not flushed out and for some reason this works in the scheme of things. Usually such stories pick one side or the other, the strikers or management. The author here seems to be scrupulously balanced in his views. The story has a factual ring to it. Interesting that the 'P.C.' is treated like an award like than a title, namely 'Spearing, P.C.'. Perhaps due to it harking back to the days when police were respected? I don't know if anyone ranks British comics the same way as American comics, but I've always considered the period between the wars to be The Golden Age (this title was bestowed on the period by Denis Gifford many times). I've always designated the war-time period as The Dark Ages, and the birth of Eagle as the starting point of The Silver Age, which extended through to the next two decades. The early 1970s are last gasp of the Silver Age as far as I'm concerned, with the precursors to a more distinctly modern style comics arriving in 1974 through 1977 (Warlord, Battle Picture Weekly, Action), culminating in 2000AD which heralded, for want of a better title The Modern Age. That said, how modern can 2000AD be considered in the year 2001? Is it well past its sell-by date as some people think -- sales have fallen ever lower for years and in 1999 dropped below 25,000 a week; Egmont Fleetway didn't release figures for 2000, but they did sell the title, which probably shows you how well it's doing. The historic moment marked the end of the history of the Amalgamated Press. There was a linear link between 2000AD and the first proper comic, Comic Cuts, founded in 1890. The Amalgamated Press became Fleetway Publications, became part of IPC Magazines, became Fleetway Publishing, became Egmont Fleetway. As 2000AD was the last of the papers to be actually published by IPC before they splintered their juvenile division -- selling off parts of the rights to Robert Maxwell -- I've always considered the nursery comics that have come out since to be the product of a separate company. 2000AD was the old guard, and as that's now produced by Egmont under license -- somebody else actually owns the title and it's edited outside of the Egmont Fleetway building -- that, to my mind, severs the link. It could be said that the A.P. era (which encompasses a number of different name changes) lasted 110 years. Things will never be the same again. And the steady decline all started back in the mid-sixties. Steve's Comprehensive British Story Paper Index For all the information you'll ever need on the subject. See Australian Book Collectors for more information on collecting storypapers. You may find these pages of interest. Back to Collecting Books & Magazines index page.